Preaching from Memory to Hope by Thomas G. Long, Westminster John Knox, 2009, 152 pp. 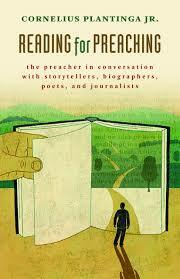 This book made me want to read more books about preaching. It’s something I do every week, and I read lots of books that give me ideas about what to say when I preach. This book, however, is more about what happens when we preach, not what we say in any given week. Long begins with a critique of narrative preaching, the style of story-based preaching that has become dominant in the last 30 years. Narrative preaching arose in response to a culture that knew its way around Christian doctrine and dogma, but felt bored and stilted in its heart. Grasping on to the stories at the heart of the Gospel was a way to get to the heart of listeners and move them. Now, however, Long points out that our context has changed. The third chapter levels a striking, searing critique against a new form of Gnosticism arising today. Long identifies four traits of Gnosticism as 1) believing that knowledge saves; 2) antipathy toward incarnation and embodiment; 3) focus on inner divine spark; and 4) emphasis on present spiritual reality rather than God’s promised fulfillment. He sees this gnosticism holding a special appeal to intelligent people, and taking shape through both those who call themselves “spiritual but not religious” and among those who ascribe to conspiracy theories about Christian history, such as those found in the books of Bart Ehrmann and Elaine Pagels. The fourth chapter turns this critique of gnosticism against one of the most beloved of the populist, critical scholars: Marcus Borg. His contention that Borg’s ideas are full of gnostic thought is thorough and convincing. I think Long is on the right track. He gave clarity and voice to many of the things I strive for in my own preaching, and questions that have lingered, unexpressed, in the back of my mind. I encourage all my fellow preachers to hear his concerns, even if you do not accept them. 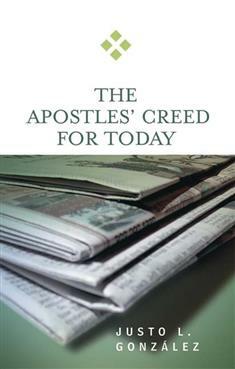 The Apostles’ Creed for Today by Justo L. Gonzalez, Westminster John Knox, 2007, 99 pp. This is the first of five book reviews on the Christian creeds (and a book in heresy), which I read in preparation for a sermon series entitled, “I Believe: Christian Creeds in Context.” Those sermons can be found here. Justo Gonzalez always offers an accessible, straightforward, learned perspective on topics of Christian history and theology, while remaining attentive to the life of faith. His theology is fairly orthodox (he is United Methodist), but he does not ignore questions or controversies. His book on the Apostles’ Creed is no different. While it was among the shortest I read in this whole series, it still contained a great deal of insight and information I found nowhere else. Gonzalez begins with a “fact or fiction” analysis of the origins of the creed, describing the fiction that the original disciples each authored one sentence of the creed while sitting around a table and the fact of the creed’s uncertain origins but precursor “R” (for Rome) widely known throughout the early Christian community in the early second century. He also traces the use of the creed in interrogatory form from early Christian baptism to its status as a personal statement of faith or even a test of faith in contemporary context. The remainder of the book offers a short, 3-5 page commentary on each section of the creed, which Gonzalez divides into 13 sections. The commentaries he offers are brief, but insightful. Rather than the approach many authors take of seeking scriptural support for each creedal claim, Gonzalez mixes a bit of scripture, some early Christian context, and some history of the controversies that were implied by each creedal claim. The result was a helpful, interesting mixture of ideas for preaching. For example, one of the observations I found only in Gonzalez’ work was a discussion of the Roman paterfamilias and Greek pantokrator as context for the creed’s opening lines. To the original ear, the image of “God the Father Almighty” likely conjured power and authority far more than tenderness and care. However, that same power and authority did point beyond the worldly powers of Rome and all systems of oppression toward a higher authority of redemption, especially when paired with addressing Jesus as Lord. Gonzalez has a way of honing in on the key questions that are at stake in the creed, and naming them in such a way that we see how those same questions remain at stake for us as well. His brevity in this book summons the critical issues, adds relevant context, and leaves us with plenty to ponder. I recommend this slim volume to any preacher studying the creeds for its thought-provoking content, and to small groups looking for a study. Each chapter also contains a few questions for discussion. Leaves from the Notebook of a Tamed Cynic by Reinhold Niebuhr, Westminster John Knox Press, 1929, 152 pp. This book came to me like water in the desert, finding me when my soul was dry. I read it in 24 hours on a clergy retreat when my soul and my ministry longed for refreshment. Niebuhr’s reflections offered it. 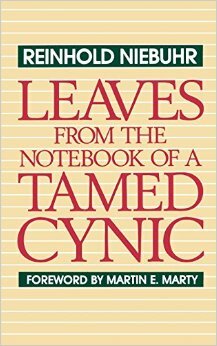 Leaves from the Notebook of a Tamed Cynic is a compilation of excerpts from Reinhold Niebuhr’s journals during his years of parish ministry in Detroit from 1915-1928. They are years of struggle and difficulty, when Niebuhr questions the value of the church and whether it can survive in to the future. He confronts the social ills of industrialization, economic stratification, and poor treatment of the working people that comprise his parish. He is unabashedly liberal in the face of rising fundamentalism. He gets discouraged, angry, frustrated and occasionally despairing. In short, he’s a pastor just like me, with a whole pile of doubts and discouragements about the work we share and whether it matters at all. It made me feel so much better to know that these problems are not new to me or to my era of ministry. That’s exactly how I had been feeling lately–that the Gospel I have vowed to preach is in direct conflict with all the common wisdom and desire of our day, and that I can either couch it gently enough to try and be heard or preach boldly and risk being dismissed as completely irrelevant. So it must be gentle, but firm. Compelling by charm, not compulsion. Niebuhr discovered in his first year long ago what I have as well: we can, we must, fall in love with the people. It is a deep love and appreciation for the faithful people of my parish that keeps me going, always. They are truly incredible and inspirational in their faith, and I would not let them down. It is also companionship with other pastors that keeps me going. This book added a new companion to that list. To listen in on Niebuhr’s own struggles helped me feel less alone. He confesses to all the same faults I share: to walking past a home 2-3 times before having the courage to enter for a pastoral call, to wrangling inattentive youth in Sunday School, to preaching sermons that are tamer in delivery than in preparation, to frustration with the seeming impotence of the church, to tension with preaching economic justice, and to the failure to inspire people who call themselves Christians to step up and live into the teachings of Christ. I am not the only one to fail in these ways. Niebuhr was a great one, and he did too. Then, as always, Niebuhr demands the most high standards of fidelity to the cross, and he speaks with the same tenor of theological compulsion that has always motivated me. This should be a classic on the shelf of every pastor, especially those of us who call ourselves “liberal” or, these days, “progressive.” It is a reminder of the high nature of our calling, and the low, doubt-filled and failure-ridden nature of our attempts to fulfill it. For me, receiving that reminder from Niebuhr in the context of his own ministry is both challenging and reassuring. I know I will return to this book again, and re-read it again when I feel discouraged. 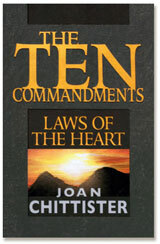 Joan Chittister, The Ten Commandments: Laws of the Heart, Maryknoll, NY: Orbis books, 2006, 152 pp. This is the second in a series of four books about the Ten Commandments, which I purchased and read simultaneously, week by week, while I was preaching a sermon series on that topic. The sermons can be found here, June 22 through July 27. 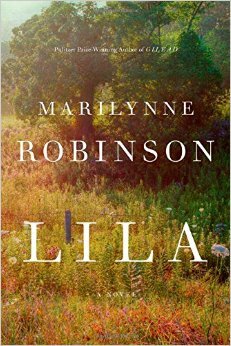 The rest of the book reviews will be posted sequentially here. Joan Chittister’s subtitle to her book on the ten commandments suits her style and contribution. Chittister, as always, speaks to the issues of the heart and soul, looking at the commandments with an eye on the spiritual dimension and attention to the call for justice in the world. Chapter by chapter, commandment by commandment, Chittister examines each in three ways: historically, examining what it meant in the context of early Judaism; in application, imagining how it applies to life today; and reflectively, proposing ways that we can reflect on what it means for each of us to follow the commandments today. If I had only one book of these four to recommend to preachers, Chittister’s would be the one. She helps unlock the fixed nature of the commandments and open them to new ways of illuminating our sins and our possibilities. David J. 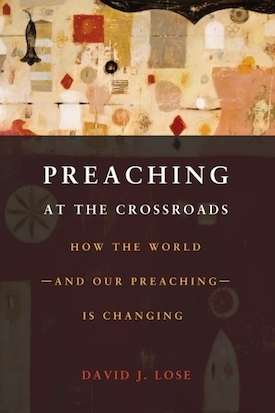 Lose, Preaching at the Crossroads: How the World–and Our Preaching–is Changing, Minneapolis: Fortress Press, 2013, 112 pp. I was hoping for that same conversational style and collaborative tone in his reflections about the craft of preaching itself, and I found it. I have been pondering for the last several years (with many others) whether preaching itself is in danger, or how preaching must change and adapt to changing circumstances. I was eager to engage Lose as a wise conversation partner on that topic, and this book did just that. In the section on postmodernism, he identifies the core problem of preaching in a postmodern context as the constant skepticism and crisis of legitimacy. How can we claim to speak truth in a world that doubts all claims of truth? He replaces the modern equation of truth with provability with a faithful claim of truth modeled on confession. Legitimacy then proceeds not from provability, but from the integrity of the confession itself–from the confessor’s honesty and from the confession’s connection to lived experience. In practice, he proposes reinvigorating Sachkritik, or “content criticism,” where interpreters “understand discrete passages of Scripture in relation to the core testimony of the biblical witness.” (36) This makes room for both an hermeneutic of suspicion and a hermeneutic of trust, and invites engagement from listeners in a conversation. Moving on to the reality of secularism, Lose identifies the primary problem with our secular culture as a crisis of hope. With the death of transcendence, “we, both inside the church and out, have lost hope–hope that there is something more than meets the eye, hope that some values exist beyond those we can construct, hope that our actions and lives are rooted in a larger framework of meaning.” (52) Our response as preachers, Lose argues, must be to draw people into the Christian story of resurrection hope, helping them to see their lives and vocations as part of a larger and more meaningful narrative. That is a tall order, to be sure, but it is indeed what we ought to strive for in our preaching and worship experiences. The final theme Lose identifies is pluralism, specifically “digital pluralism,” a world in which multiple and competing realities are immediately available for easy access via digital means. (87) Our congregations no longer dwell securely in the biblical narrative worldview. They may get a glimpse of it for an hour on Sundays, but the rest of their lives is dominated by other metanarratives, like consumer capitalism or fearful nationalism. This gives voice to one of my deep apprehensions and frustrations with preaching these days. I get people to step into this worldview for one hour every week. Even if they are convinced and convicted by it, Fox News and CNN and the world of advertisement gets them for the other 167 hours of every week. I can be persuasive that the biblical narrative matters, that it impacts their persons and politics, but I can’t do it in isolation. Lose urges us to move our congregations toward not just biblical literacy, but biblical fluency, “the ability to think–without thinking–in the target language.” In order to do this, we need to not just teach the biblical narrative, but engage people in a participatory way in contemplating how the story impacts their lives, so that they can do what we preachers do–interpret scripture for themselves. He urges participatory practices, visitation to parishioner’s workplaces, and online conversations to this end. Preaching at the Crossroads sets forth a high standard and an enormous amount of work to do. Yet I end the book feeling both challenged and encouraged, as I always do when I read Lose’s work. I also feel much less alone. It is not just me and my preaching that are struggling with these issues–it is all of us who weekly strive to deliver the good news to those who come into our sanctuaries. I recommend this book to all who care about that endeavor.